The mobile application is not an option anymore. It’s a requirement. Nowadays it is necessary for most of the online businesses like e-commerce, and sports portals so tech companies are making their website mobile-friendly and developing mobile applications to boost their business. Today’s mobile application has made things simpler for us. Most importantly, they convert the complex website into a simpler and precise form, which can be accessed from any Smartphone. The mobile application has covered all the sectors including gaming and sports. From live streaming of match, expert analyses, detail information of game and scoreboard are available on sports application. Developing a gaming application was not simple work but with advanced technology, it has become quite flexible and simple. A professional sports app development company can make a sports application that accomplishes all need of people that are related to gaming and sports. User Profile- User can make their profile and set the preference and notification according to their choice. Individual Player Profile- There should be an option where users can read about player stats, records, and performance in a listed way. Sports news and alert- This is the must-have for sports application. The developer needs to update their audience ASAP. Comment option on player and match- Sports lovers love to discuss games so there should be an option where they can connect with other users in sports application. Social sharing buttons- there should be an option through which users can share the sports articles and images on their social media account. Post-Game Highlights – This option is for all those who miss out the game. For example, your mobile application should upload the great moments of games, so that your user can watch the glimpse that they miss out. Designing a sports application – This is one of the most critical elements that define the success of your mobile application. Give them the options- Don’t limit your application to single game. If you want to popularise your application, then try to include maximum sports features. Because the different country follows different game followers. If your app misses out on this, then there is a chance that you will miss on the larger part of an audience. iOS Development –Countries like the USA, where most of the people are iPhones user and work on the iOS operating system. 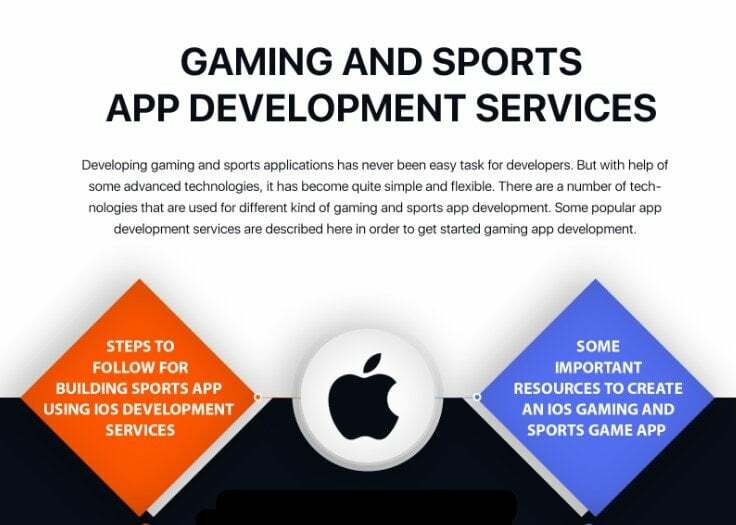 So to make the gaming and app development service on iOS first, you need to hire a sports app developer to handle your entire project. Create an account with apple developer connection and then write code of the application. At last, connect with iTunes to submit your application to the app store. There are some other resources also like sprite builder, Apple developer, and Github. Android – Most of the people uses android operating phones. Countries like India, where a large number of people use the Android smartphone and avid followers of sports. To make an android sports application; you need to hire an android developer. Along with that, you also need to share a dummy application with the developer, so that they have an idea about what kind of mobile application you want to make. The developer needs to install the game in Google Play Console to manage Google Play game services and configure the application ID in your Android game project. There are some resourceful tools like PlayIR, Gidereous mobile, game code and game editor. Cross-platform app development – To create an application for cross-platform application, developers work on the visual studio software. The programmer needs to have a strong command on Xamarin tool and needs to work on the single code to run the application on different platform- Android, iOS, and Windows. Along with a programming process, you need to hire a designer to make your task easy and simple. There are some useful resources like unity mobile, Corona SDK, and unreal development kit. Nowadays human beings are so busy that they can’t sit in front of the TV for a long time, but they also want to keep themselves updated for game and sports. These sports applications work perfectly well for them. Sports fan are usually very passionate. A single bug can keep you out of the race. Keep the above recommendation in your mind and achieve the success.